Hope Stout was always a bright, energetic, caring young girl. When she was diagnosed with osteosarcoma, a rare bone cancer, in 2003, she didn’t let it get her down or cause her to lose her faith. Instead, she took it as an opportunity to help others. While receiving radiation treatments, Hope discovered that some of the children in the hospital with her didn’t have their parents or family with them each day like she did. Hope said, “the thought of some little kid going through this alone, but still having the faith is amazing. I want to do whatever I can to make their stay as great as it can be.” Hope’s selfless Wish was huge. 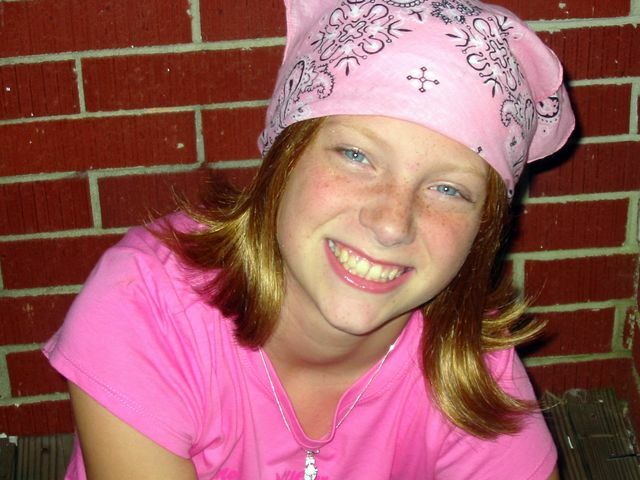 Hope lost her battle with osteosarcoma in January 2004. This past Sunday would have been her 21st birthday. Although Hope may not physically be with us any longer, her Wish still lives on. Hope has been an inspiration to me for the past eight years, and I am grateful to have known her. Many people have been touched by her story and her Wish has been a blessing for so many children and their families. If a 12-year-old freckle-faced, red-headed girl battling cancer can help fulfill the wishes and needs of others, why can’t more of us do the same? I’m engaging in the #HopesWish21 campaign not only because I personally care about the March Forth With Hope Foundation (MFWHF), but because I think every child and family facing a life-threatening medical condition deserves to have HOPE. The goal of #HopesWish21 is to encourage 1,000 people to donate $21 this week to MFWHF, which provides financial relief to families with children suffering from cancer or other life-threatening diseases. I’ve donated to this campaign and am eager to see how much HOPE the city of Charlotte can give families this week. Follow @HopesWish on Twitter for details and campaign updates. Happy Birthday, Hope. I’ll never forget your caring heart and that beautiful smile. Thank you all for being a part of this challenge! Just know the money will go to help families with sick children with life threatening illnesses with their mortgage payments, light bills, car payments, gas cards, to try to make this time with their kids in the hospital less of a stress!!! Their is such a need as we are trying to add more hospitals to our list! March FORTH with HOPE!!! It would be great if you would enter the information to the article about how to contribute. There are some of us who still don’t twitter.…… Thanks!! You can donate $21 via http://www.marchforthwithhope.org/ ! Hey, Sandra and Carole: you can donate $21 via http://www.marchforthwithhope.org/ ! No need for Twitter to donate! Just go to http://www.marchforthwithhope.org and click on the Donate tab. This will take you straight to PayPal. Very easy and much appreciated! My daughters cheer at Spirit of Hope each year. Wonderful event for a wonderful cause. Happy birthday Hope! Thanks for helping out with your donations, everyone! Thanks for providing the links to MFWHF, Crystal and Samantha. You can also click the March Forth With Hope Foundation (MFWHF) link directly in the post. I’m honored to be a part of the #HopesWish21 campaign! How amazing was this little girl!! Her life can teach us so many things, but one being that we need to put others before ourselves. God Bless her and her legacy her on Earth. I hope that her life and dreams of others having their wishes come true is not in vain. Thanks for sharing this! !